The Parity Act of 2008 made it illegal for most insurance plans to discriminate against people with behavioral health conditions by offering less generous benefits. Now, if a plan offers a mental health or substance use benefit, it must provide a benefit that is at least equal to the physical health benefit offered. This page provides information on how to identify common parity violations, what to do about it if you're experiencing a parity violation, and how we can help. 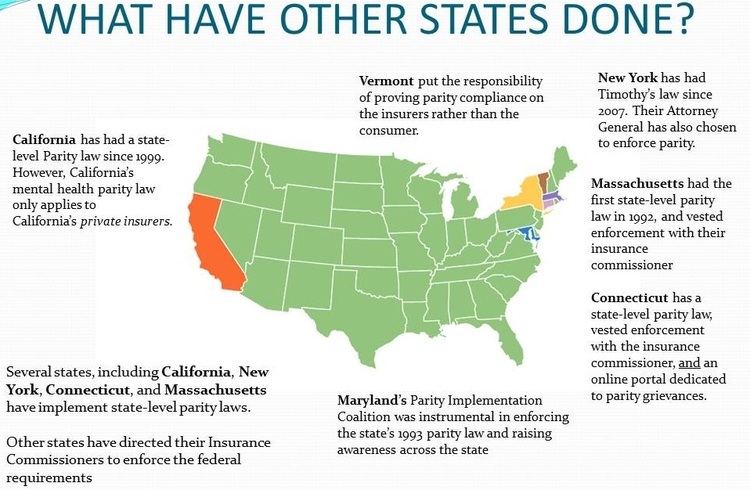 Enforcement of the Parity law has been left up to each individual state, usually through their Insurance Department, or state-level Parity laws. It's up to each state to enforce parity. In Pennsylvania, the three branches of state government can each play a role in enforcing parity. THE STATE EXECUTIVE BRANCH: The Insurance Commissioner, who is appointed by the Governor, can issue guidelines and regulations to enforce parity. THE STATE LEGISLATIVE BRANCH: The General Assembly can issue legislation creating a state-level parity obligation, and authorizing the enforcement of parity by a state-level agency, usually the Department of Insurance. The federal government still has a role to play if the state government is unable/unwilling to enforce parity. In January 2013, the Centers for Medicare and Medicaid Services issued guidance, indicating that Medicaid and Medicare plans were subject to parity rules. In 2010, Congress passed the Affordable Care Act, which defined Essential Health Benefits for all insurance plans. These EHBs included behavioral healthcare, which meant that plans with more than 50 people must be parity compliant. Congress also has the option of passing further legislation to enforce parity. The Federal Court System can hear suits brought against insurers for violations of the law. There have been a number of suits in federal courts. See "Parity Across the Nation" for more information. Regulation: The state Insurance Department proactively assumes authority to regulate insurance providers in the state, monitoring and enforcing violations. Legislation: The state assembly authorizes the Insurance Department or other agency to enforce parity. Litigation: Suit is brought in state or federal court against insurance providers to force parity enforcement. Contact Your State Legislators and ask them to develop a plan to enforce Parity in Pennsylvania. To look up your Pennsylvania State Legislators using your address, click here. Contact Governor Tom Wolf and ask him how his Administration will enforce Parity in Pennsylvania. The contact information for his Regional Offices can be found here. Parity Track, a joint project of the Kennedy Forum and the Scattergood Foundation is an excellent way to learn more about Parity. Representative Thomas Murt (R - Montgomery County) introduced a legislative proposal which would give the Pennsylvania Insurance Department explicit authority to enforce parity in Pennsylvania. The legislation would also give the General Assembly the ability to assess the parity issues across the state, and give it the ability to track parity enforcement efforts. You can read the full text of the bill, and see the list of co-sponsors here. EDIT: Reintroduced in February 2017 as HB 440. Historically, people with behavioral health and substance use conditions have faced discrimination in insurance coverage. Behavioral health benefits offered were less generous and individuals seeking treatment often faced significant barriers to care. The most significant legislation combatting this inequity was the Mental Health Parity and Addiction Treatment Equity Act (“Parity”), signed into law in 2008 by President Bush. At the core of the Parity Act is fairness - treating mental health and substance use conditions the same as we treat physical conditions. Enforcing existing federal Parity requirements at the state level would expand both the treatment options and financial resources of families struggling with behavioral health and substance use conditions. Parity implementation legislation has been introduced by Representative Tom Murt (R - 152nd Legislative District) and 25 co-sponsors. HB 2173 would address these disparities, expanding access to care across the Commonwealth for many Pennsylvanians, and specifically address the needs of those with opioid use disorders. · Impose no new behavioral health benefits on private insurance companies. This state legislation would simply direct the Insurance Department to monitor parity implementation and ensure compliance with existing law. · Increase compliance with the federal parity law at the state level and will save the state money by reducing reliance on public insurance programs. Currently, when people develop a behavioral health condition and are unable to access appropriate care through their private insurance, they are told to enroll in Medicaid. Statewide legislation that directs the Insurance Department to implement the federal law will save the state money in the long run, as private insurance begins to provide more of the services they are required to cover. · Enforce Parity and improve the lives of your constituents, as they are able to access the treatment they need. One of the most common problems individuals and their families report is getting treatment when they need it, and understanding what behavioral health coverage they have through their insurance. Many people have rights to equitable care in the behavioral health system through the federal Parity law, but it is not being adequately enforced in Pennsylvania. · Bring Pennsylvania in line with other states. Because states regulate their own insurance market, the federal government gives states primary authority to enforce Parity. Statewide legislation would bring us in line with other states and strengthen legislative oversight. · Educate the public on their Parity rights. Less than 5 percent of Americans are aware they have rights and are entitled to care under the law, and as a result, many consumers aren’t appealing denied claims or request for services. This legislation will improve efforts to educate the public.